RED WING, MN (January 2010) —Irish Setter’s patent-pending ExoFlex technology brings a welcome change to the rubber boot category – fit. The ExoFlex panel placed in the back of the boot shaft expands to accommodate the back of the foot, offering easy entry into rubber boots. Then the panel contracts for a lock-tight, high-performance fit, creating a great fitting, easy on/off waterproof, scentproof rubber boot. The new ChoreMaster rubber boots feature this new performance technology. 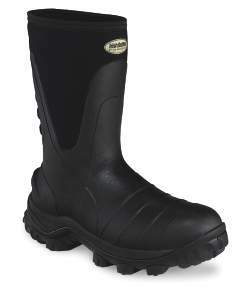 The non-insulated, scent-free waterproof ChoreMaster boots are available in a black 12” version (#4850) and a black 17” version (#4851). The new Irish Setter ChoreMaster boots are built on a new last that provides a slim, comfortable profile. The outsole is designed with a performance-enhancing rocker Mud Claw sole with mud releasing cleats. Serrated cleats upfront provide traction on hills. 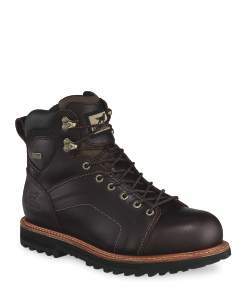 The Irish Setter ChoreMaster boots are available in whole sizes from Men’s 7-15 and ½ sizes from Men’s 8-14. The new ChoreMaster rubber boots will be available in July 2010 at leading outdoor retailers. Suggested retail is $99. Visit www.irishsetterboots.com for the retailer nearest you. Based in Red Wing, MN, Irish Setter is a division of the Red Wing Shoe Company, Inc. that includes a full line of performance hunting boots, fishing shoes and outdoor casuals. Irish Setter continues to use leading technologies and the finest materials to provide customers the best quality outdoor footwear. For more information about Irish Setter’s heritage, products and retailers, visit http://www.irishsetterboots.com. Irish Setter. The Hunt Never Ends. RED WING, MN (January 2010) —Irish Setter extends its hunting boot line to include the HammerHead Work/Hunt multi-purpose boots. It’s a natural extension because Irish Setter boots are closely tied to the legendary work performance of Red Wing Shoe Company. In fact, the first “Setters” were work boots named Irish Setter because the leather color was similar to that of the Irish Setter breed. The non-insulated Irish Setter HammerHead boots feature a lightweight aluminum safety toe, UltraDry waterproof construction and a unique sole platform which increases flexibility and reduces muscle and bone fatigue. The Dynamic Suspension System is a patented mechanism that reduces fatigue caused by underfoot pressure through a shock attenuating mechanism. The system works by redistributing the downward force produced under the heel during each stride. The end result is a more comfortable experience with fresher legs over the course of the day. The Goodyear beaded welt construction and full-grain leather provide a premium look and performance. The Hammerheads feature an oil/slip-resistant TerraMaster Outsole with flattened, self-cleaning airbobs. The heel is built to accommodate work on ladders. These boots meet the ASTMF 2413-05 standard. The HammerHeads are available in a 7” version (#4830) and a 9” version (#4831). They’re available in men’s sizes 8-14D and EE. “We’ve seen some research at states that 26% of hunting boots purchased are also used for work. Irish Setter’s HammerHead multi-purpose boots were created using our insider knowledge of both the work boot and hunting boot markets. They incorporate great performance features and provide a good value,” explained Irish Setter Product Manager, Kyle Rackiewicz. The new HammerHead multi-purpose boots will be available in July 2010 at leading outdoor retailers. Visit www.irishsetterboots.com for the retailer nearest you. Editor’s Note: Contact Kim Emery at Firefly Publicity for username/password to access media information and images. kim@fireflypublicity.com, 651.388.7896. The recommended images for this product are: 4860,4831. RED WING, MN (January 2010) — Irish Setter has created a women’s specific knee boot with 1000 grams of Thinsulate Ultra insulation. The Ladyhawk #2887 is a 15” knee boot featuring Realtree All-Purpose camo, ScentBan, easy on/off side zipper and Ultra Dry waterproof construction. Irish Setter’s Ladyhawk hunting boot line benefits women in several ways. Irish Setter donates two percent of each Ladyhawk boot purchase to support The Breast Cancer Research Foundation®. In 2009, Irish Setter donated $10,000 to The Breast Cancer Research Foundation as a part of this program. The boots not only benefit a worthy cause – they also aim to improve the fit, comfort and performance of the sportswoman with its unique design and fit. While most women’s hunting boots are nothing more than modified men’s boots, the Irish Setter Ladyhawks have been specifically created for women. Irish Setter developed a last that is shaped and detailed to provide superior fit for women. From a lower volume heel cup, to adjusted arch support to a more accommodating collar, the detail in these boots is geared toward higher performance and comfort for women. The Irish Setter Ladyhawk series includes the Ladyhawk #3886 7” hunting boot featuring 600 grams of Thinsulate Ultra insulation and brown on brown leather/nylon uppers. The Ladyhawk #3887 contains 1000 grams of Thinsulate Ultra insulation in a 7” Mossy Oak Break Up Camo/Brown leather package. The camo versions include a camo-wrapped EVA midsole. All Ladyhawks shares the streamlined silhouette, design details and proven performance features. The boots are available in women’s sizes Medium 5-11. “Irish Setter’s Ladyhawk line has been a great success. 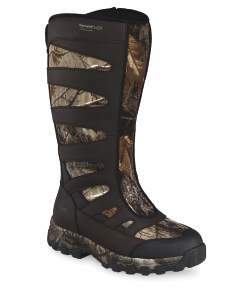 We added this new knee boot to give women more options,” explained Irish Setter Product Manager, Kyle Rackiewicz. According to the US Fish & Wildlife’s 2006 National Survey of Fishing, Hunting and Wildlife-Associated Recreation, 1.2 million women in the United States participate in hunting. Nine percent of the US hunters are women. The new Ladyhawk boot #2887 will be available in July 2010 at leading outdoor retailers and will retail for $149. Existing Ladyhawk styles #3886 and #3887 are available now for $109 and $119 respectively.Visitwww.irishsetterboots.com for the retailer nearest you. Editor’s Note: Contact Kim Emery at Firefly Publicity for username/password to access media information and images.kim@fireflypublicity.com, 651.388.7896. The recommended images for this product are: 3886, 3887, 2887. Visit http://www.fireflypublicity.com for more information. Firefly Publicity works closely with writers and editors to place products in media like magazines, newspapers, on-line content, radio and television. Public relations is a cost effective way for companies to maximize their marketing or advertising budget. Firefly Publicity is a results-oriented pr firm located in Red Wing, Minnesota. If you’re interested in gaining exposure for your company’s products, please contact Kim Emery at Firefly Publicity. RED WING, MN (January 2010) —Irish Setter extends its hunting boot line to include the Trail Phantom Safety Work/Hunt multi-purpose boots. It’s a natural extension because Irish Setter boots are closely tied to the legendary work performance of Red Wing Shoe Company. In fact, the first “Setters” were work boots named Irish Setter because the leather color was similar to that of the Irish Setter breed. The Irish Setter Trail Phantom Safety boots feature a lightweight aluminum safety toe and UltraDry waterproof construction. The bottom package includes a polyurethane midsole which is more durable and chemical-resistant than EVA and the ShadowTrek Outsole which is designed to be durable, yet lightweight and flexible for enhanced comfort. 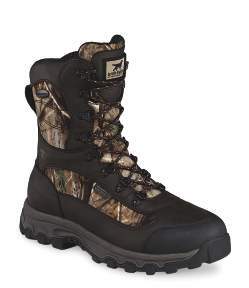 These boots meet the ASTMF 2413-05 standard. The Trail Phantom Safety boots are available in a non-insulated 9” brown version (#4840), a non-insulated 9” black version (#4841) and a 9” Realtree AP Camo version with 400 grams of Thinsulate Ultra insulation (#4842). They’re available in men’s sizes 8-14D and EE. “We’ve seen some research at states that 26% of hunting boots purchased are also used for work. 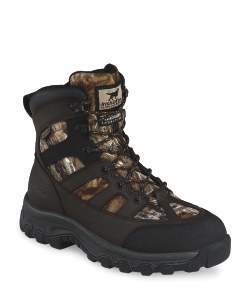 These lightweight multi-purpose boots demonstrate our extensive knowledge of hunting boots and work boots. 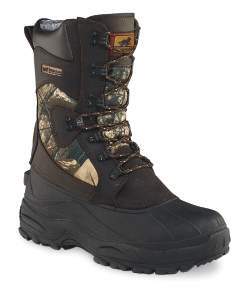 They’re great cross-over boots,” explained Irish Setter Product Manager, Kyle Rackiewicz. The new Trail Phantom Safety multi-purpose boots will be available in July 2010 at leading outdoor retailers. Visit www.irishsetterboots.com for the retailer nearest you. Editor’s Note: Contact Kim Emery at Firefly Publicity for username/password to access media information and images. kim@fireflypublicity.com, 651.388.7896. The recommended images for this product are: 4840,4841,4842. RED WING, MN (January 2010) — The Irish Setter Gunflint hunting boots were specifically designed to appeal to big game hunters and their wallets. The Gunflint series are built with Thinsulate insulation and a Goodyear welt with UltraDry waterproof construction. The rugged Bulls-Eye air bob carbon rubber sole features an aggressive design that provides more contact points with the ground for greater stability and traction on uneven terrain. Cork-lined EVA midsoles provide all-day comfort and cushion against shock. Sturdy steel shanks deliver additional support. 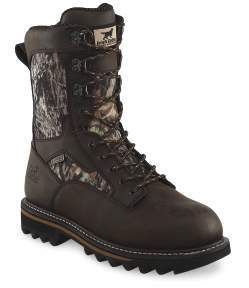 Camo nylon uppers with polyurethane-armored leather enhance durability and weather resistance. Style #816 is available in Realtree AP Camo and 200 grams of Thinsulate insulation. Style #824 offers 800 grams of Thinsulate Ultra insulation in a brown fabric/leather upper. Style #818 is available in Mossy Oak Break Up Camo with 1000 grams of Thinsulate Ultra Insulation. The Gunflint starts at $99. “We anticipated the need for value-priced hunting boots that also deliver on performance. We worked diligently to create this great offering for our customers,” said Kyle Rackiewicz, Irish Setter Product Manager. The new Gunflint boots (#824) will be available in July 2010 at leading outdoor retailers. Other Gunflint styles (#816 and #818) are available now. Visit www.irishsetterboots.com for the retailer nearest you. Editor’s Note: Contact Kim Emery at Firefly Publicity for username/password to access media information and images. kim@fireflypublicity.com, 651.388.7896. The recommended images for this product are: 816,824,818. RED WING, MN (January 2010) — Irish Setter is adding more styles to its youth hunting boot line. 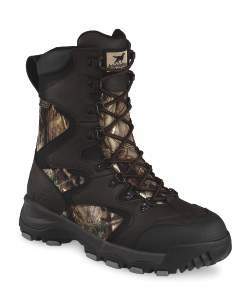 The Kit Fox hunting boot was designed specifically for boys and girls. Although the boots look just like Dad’s, they are built on youth-specific lasts. Like all Irish Setter hunting boots, the Kit Fox boots are built for performance and utilize the same materials and constructions as the adult hunting boots. All Irish Setter Kit Fox boots feature Ultra Dry waterproof construction, ScentBan and a carbon rubber sole. These sleek and lightweight boots are offered in youth medium sizes 1-6. Style #2803 has an easy on-off side zipper and is available in Mossy Oak Break Up Camo with 600 grams of Thinsulate Ultra insulation. And 1000 grams of Thinsulate Ultra insulation is offered in Realtree All-Purpose Camo for style #2804. “We’re expanding upon the success of our Kit Fox youth hunting boot line. We want to make kids’ outdoor experiences enjoyable so we’ve added more insulation options,” explained Irish Setter Product Manager, Kyle Rackiewicz. The new Kit Fox boots (#2803 and #2804) will be available for $79 in July 2010 at leading outdoor retailers. Visit www.irishsetterboots.com for the retailer nearest you. Editor’s Note: Contact Kim Emery at Firefly Publicity for username/password to access media information and images. kim@fireflypublicity.com, 651.388.7896. The recommended images for this product are: 2803,2804. RED WING, MN (January 2010) — Irish Setter’s award-winning Snow Claw XT insulated boots have some new company in Irish Setter’s Extreme Cold boot line.The new Irish Setter SnowShield #2896 provides a mid-tier option at $149. The SnowShield features UltraDry waterproof construction, ScentBan, 1600 grams of Thinsulate Ultra insulation, Realtree AP Camo uppers and aggressive Snow Claw sole. The Snow Claw outsole tread pattern incorporates a multi-level cleat configuration that penetrates various depths of snow and mud – resisting slip by minimizing the creation of sheer layers.The new Irish Setter SnowHound boots include 400 grams of Thinsulate Ultra insulation, removable 7mm felt liner, split leather with seam-sealed thermoplastic rubber shell. Style #1863 is available in all brown while style #1864 is offered in Realtree AP Camo. Both retail for $89.The Snow Tracker Pacs have been a favorite for years. They delivered 1400 grams of Thinsulate Ultra insulation, ScentBan and UltraDry waterproof construction. Style #2871 is available in Mossy Oak Break Up Camo and #2872 has an all brown upper. The Irish Setter Snow Tracker Pacs are available for $199. The award-winning Snow Claw XT boots provide the ultimate insulation package with 2000 grams of Thinsulate Ultra insulation and Aerogel for underfoot insulation. Aerogel is a nanotechnology used by NASA to stop temperature transfer. The Irish Setter Snow Claw XT #3888 is a 10” boot with 2000 grams of Thinsulate Ultra insulation, UltraDry waterproof membrane, ScentBan and aggressive Snow Claw XT Sole. The Snow Claw XT #3889 provides the same technical components but in an all brown upper. The suggested retail price for the XT versions is $179. The latest Snow Claw XT styles add a convenient side zipper for easy on/off and bring the height of the boot up to 15 inches. The Irish Setter Snow Claw XT #4888 is a 15” boot with 2000 grams of Thinsulate Ultra insulation, Aerogel technology, UltraDry waterproof construction, ScentBan, Mossy Oak Break-up Camo and aggressive Snow Claw XT Sole. The Snow Claw XT #4889 includes the same technical components but in an all black upper. The suggested retail price for these 15” XT versions is $199. “Irish Setter has developed an extensive cold weather or insulated boot line offering a variety of insulation levels and price points from our entry level SnowHound boots to our premium Snow Claw XT boots,” said Kyle Rackiewicz, Irish Setter Product Manager. The new insulated boots will be available in Fall 2010 at leading outdoor retailers. Existing boots are available now at some retailers or on-line.Visit www.irishsetterboots.com for the retailer nearest you. Editor’s Note: Contact Kim Emery at Firefly Publicity for username/password to access media information and images. kim@fireflypublicity.com, 651.388.7896. The recommended images for this product are: SnowHound 1863, 1864; Snow Tracker Pacs 2871, 2872, SnowShield 2896, Snow Claw XT 3888, 3889, 4888, 4889.Visit www.fireflypublicity.com for more information. Firefly Publicity works closely with writers and editors to place products in media like magazines, newspapers, on-line content, radio and television. Public relations is a cost effective way for companies to maximize their marketing or advertising budget. Firefly Publicity is a results-oriented pr firm located in Red Wing, Minnesota. If you’re interested in gaining exposure for your company’s products, please contact Kim Emery at Firefly Publicity.